Take a break from lounging by the pool or on the beach and get into some rapids! We have two levels of river rafting. 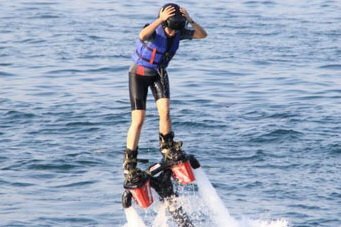 The Telaga Waja is for those who want a thrill. It’s also beautiful, but with 5 meter drops, hairpin turns and small waterfalls, it’s definitely for those who are looking for some excitement. The Ayung River near Ubud is more popular and also more gentle. With class 2 and class 3 rapids, it’s a nice paddle as you float along the lazy river, soaking in the scenic jungle. You’ll experience a few rapids, but no heavy drops. Both rivers are safe for first-time rafters. There are two sessions for rafting both rivers, a morning session and an afternoon session. The major differences between the two rivers are distance, popularity and of course, difficulty. The Telaga Waja is near the Village of Karangasem in northeast Bali and takes a little longer to get there from most tourist locations. The river is not as popular as the closer Ayung River in Ubud, but it is more challenging. It ranges from a class 3 to class 4 depending on rainfall. During the wet rainy season (October – March), expect the rapids to be class 4 and only for intermediate level rafters. During the dry season (May – September), it is usually fine for all levels. The Ayung River is for those who want to admire the jungle and enjoy a lazy float down the river with a few fun rapids in between. 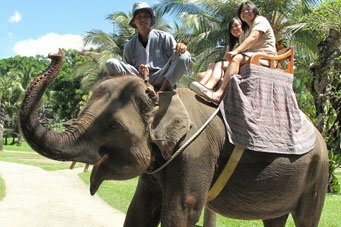 It’s just outside of Ubud so relatively close to most hotels, which also means that it is more popular and will be more crowded. Both rivers are fine for beginners, but if you’re not sure, try the Ayung first, especially with kids. Your friendly, English-speaking driver will pick you up at your hotel at a designated time and will take you to the river drop off point in our air conditioned van. You’ll then be given a chance to change into your rafting clothes or swim suit, will don your helmet and life vest and receive your safety briefing from your guide. Due to the nature of the raft, you may be put in a boat with other rafters who are not a part of your group. This is done for safety reasons and for boat efficiency. You’ll then enter the raft and practice a few maneuvering technics and start your trip down the river where, depending on the river you’ve chosen, will engage large or small rapids for the next several kilometers. Once you arrive to your destination, you’ll be given a chance to rinse off and change into dry clothes. Meanwhile, we’ll prepare a traditional Indonesian meal for you with coffee, tea and other beverages. When you’re finished eating, you’ll get a chance to purchase photos of your experience before getting on the van and heading back to your hotel. US $50.00 per person (minimum 2 people per group). This fee includes all charges except for the purchase of your photo. We try to accommodate your cancellation requests as best we can, but please note that the fee is nonrefundable if you cancel on the day of or prior to your trip. This is because we have made other commitments and scheduling arrangements that cannot not be changed. We apologize for any inconvenience this may cause. Belongings not needed during any part of the trip will be locked safely in our van with our driver. Can I drink the water in the river? No. Drinking the water in any river in Bali will make you sick. Only drink water that has been properly filtered. Are children allowed on the rivers? Yes, but please let us know at the time of booking the ages of your children. During wet periods, some rivers may not be suitable for children. We will know at the time of booking which river is most appropriate for your kids. How do I choose between the to rivers? Both are generally fine for beginners, but there may be some exceptions during the wet season when rapids are at their biggest. 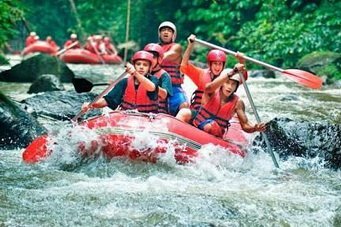 If you are not sure, you can always try the easier Ayung river first, but if you know you want the most challenging experience with more excitement we recommend Telaga Waja. If you are still in doubt, contact us here and we can help you chose a river that is best for you. Are there any snakes or crocodiles in the river? No. These rivers are safe from dangerous animals. In the jungle you may occasionally see snakes, but it is very, very rare to see them in any part of the river we raft in. How many tourists and rafts are on the river? The river association limits the number of rafting companies on the river at any one time so crowds are kept to a minimum. Even so, since the Ayung river is easier and closer to most tourist areas, it gets the larger crowds. Is it really necessary to hire a guide for the river? Yes. 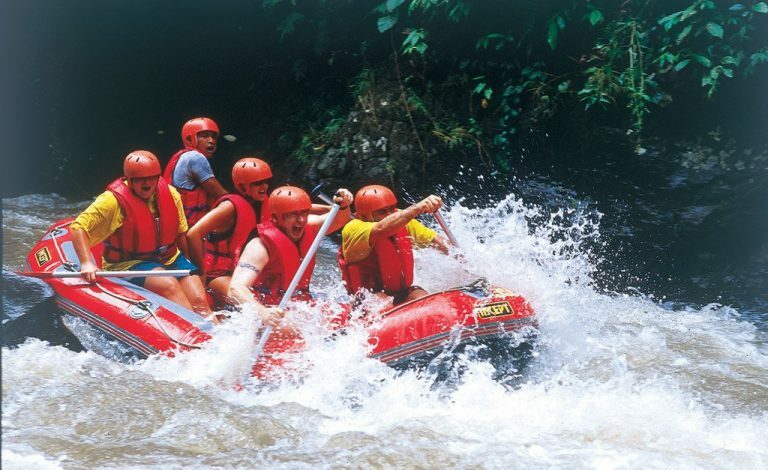 You cannot engage in any sort of river rafting in Bali unless you are using a licensed river company.